Sparkly things have come to Gina K. Designs! Everyone needs to play with the new Glitz Glitter Gels because they are absolutely amazing. I love that they are so creamy rather than ‘crunchy’. I have used other glitter paste products in the past that have a very crunchy glitter texture, and this glitter gel is the complete opposite. Another thing I noticed is that it does not dry instantly, which really helps with cleaning the stencils. Overall, amazing product! As soon as I saw these flowers, I knew I wanted to make a flower bouquet that looked like it came straight from a farmers market. I honestly don’t know how I made the kraft paper flower holder thing. There was so much folding and cutting, and it finally just appeared. I started feeling like a photographer with this shot. And once again, I failed to create a card that fits within the boundaries of a normal A-2 envelope. I absolutely love sunflowers, and I think Gina’s Wild Dandelion ink is gorgeous as a sunflower color. Loved using the black glitz gel as the flower tummies. A lil up close for you. The black glitz gel has such pretty silver flecks in it that reflect the light. For some reason, when I made this card, I didn’t think about it needing a greeting. Looking at it without a greeting, I just feel like it’s missing something. There’s not much room, but if I were to make the card again, I would put this greeting there. I love the sunshine greetings! Gina K. is giving away a $50 gift certificate to one lucky winner who comments on all the blog posts for today. The links to each person’s blogs are right below. 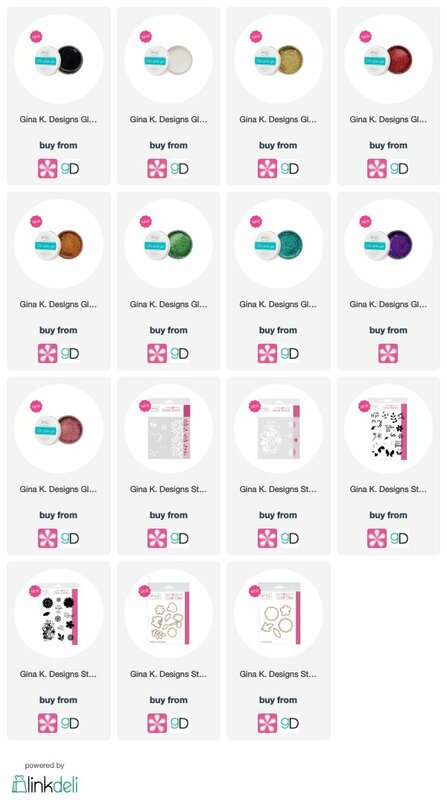 Also, for anyone interested in getting their own glitsy gels, the links to buying them either at Gina K. Designs or at Therm-O-Web are right below! So beautiful! The glitter really sets them off! Awesome cards,the glitter just makes everything pop! Love the wonderful variations you can do with the flowers. The sunflowers are great! Love the glitter! Lovely cards, every single one. Thank you for describing the texture and consistency of this glitz glitter gel…..sounds so nice to use. Thank you for sharing your pretty work. Such lovely cards! Can’t wait to try this Glitz Glitter Gel! Love the added texture and sparkle! Beautiful colors too! Oh what beautiful and sweet cards! Fabulous layers, textures and compositions. Awesome! The sunflowers say summer to me, and make me smile. I love hoe cheery both cards are. I thought the floral bouquet card was my favorite, until I saw the Sunflower card. Both are lovely! Beautiful cards! I especially love the red bouquet. The glitter colors are so lovely and, you’re right, peferxt for flowers. OH MY WORD! Your cards are so very creative and love what you did with the flower bouquet! Absolutely gorgeous cards! Really great cards, the flowers are so sparkly and spring like! So very pretty. I love the sparkle on the flowers. Awesome cards! Love the sparkle! These cards are perfect for spring, so cheerful! Thanks for the inspiration. These cards are so pretty and gives me hope spring will be here soon. Thanks for sharing. I love this card. Sunflowers and a fence! How could you go wrong? These cards are so pretty. I love the flowers! lovely projects. I am inspired by you. Wonderful details with the sparkles in just the right places. Thanks for sharing. Beautiful cards Emily! They are both so bright & cheerful, the Sunflower card and the Rose bouquet one. I love them both! Truly truly magnificent! The flower bouquet card is great! Your cards are beautiful, love them all. How’s that commercial ditty go: “I want them all”. That is how I feel after seeing how you used these products in such gorgeous ways. Thanks so much for inspiring me. They are on my wish list when I can afford to spend more money. How clever for the bouquet! Love it! Emily,love all your lovely, sparkly flowers, especially the bouquet. I never would have thought of that. Thanks for the inspiration. Fantastic cards! Your flowers are beautiful! Your bouquet of flowers is stunning…even if you don’t know how you made the wrap for them!!! Love all of your cards!! Awesome cards! I love your bouquet and creative flower holder!! Love the cards and the close up photos, too. These cards are perfect for spring, love the texture -Thanks for the inspiration. Such pretty sunflowers and I love the flower holder thingy! It’s perfect! Great ideas using these products. I just love that first bouquet of flowers…just beautiful! Fabulous cards Emily!!!! Thanks for the inspiration. Love the flower ice cream cone , and cute idea with the flowers and Pickett fence. So cute. 2 stunning creations! I especially love your bouquet card. What a fun idea!